Pretty much a straight forward hole with Out of Bounds left and a large fairway bunker on the right side. 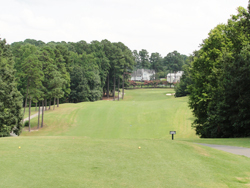 A large tree blocks the left side of the hole, so a tee shot down the right side of the fairway gives you the best looking approach shot. 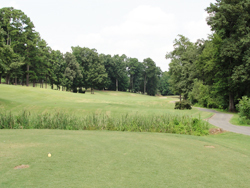 An accurate tee shot is critical. 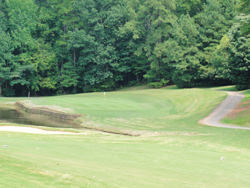 Trouble left and right, but don’t hit it too far as a creek runs across the fairway on the other side of the hill. 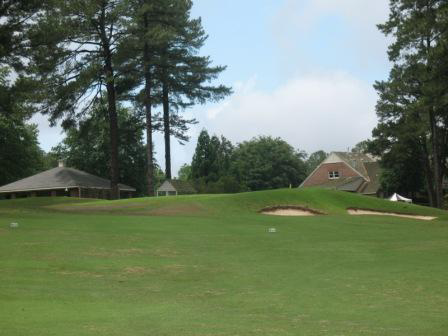 2nd shot is tough, as you need to avoid the bunker on the front right side. Once you reach the green you may still have a long way to go. 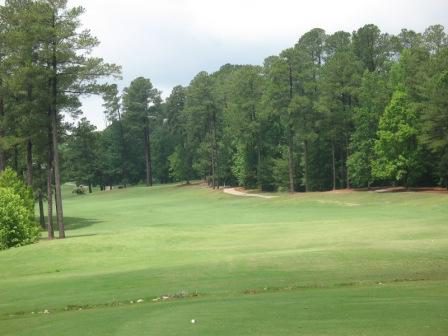 This fairway slopes from right to left so expect a hard kick left with a solidly struck tee shot. 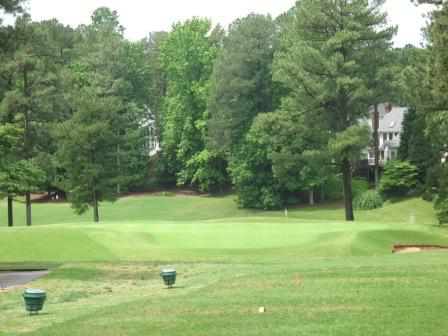 Avoid the tree and fairway bunkers on the right side of this hole to ensure a clear shot to the green. If the fairway is hit, a short approach shot is awaiting, but don’t hit your second shot long and left or you may not find it! 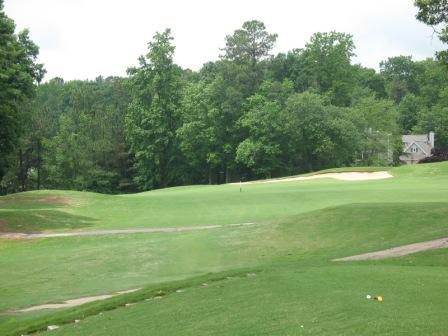 A long uphill par 3 with a two-tier green. 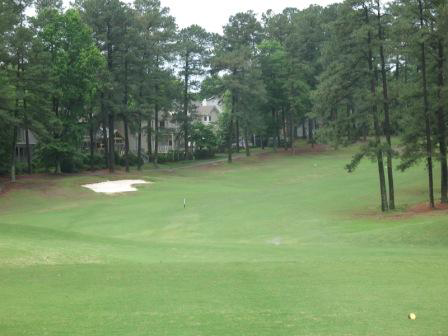 If you miss the green right or left, you may hope to find the bunkers, as the alternative could be much worse. A 3 here, is a good score. Although it is ranked the toughest, it seems to be a favorite of many. 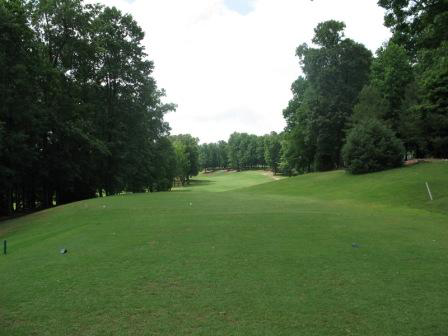 A creek lines up the entire right side of the fairway and the entire hole slopes to the right. Tee shots almost certainly kick to the right. 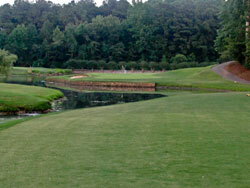 A tough 2nd shot from a sidehill lie over water to a long and narrow green can be quite intimidating! Club selection is critical! The wind seems to change directions continuously from this elevated tee box. Hit it short and you are in the water. Hit it long and you can go OB. 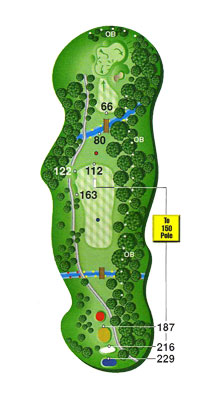 The green is tricky and depending on the pin placement, three and four putts can become common. 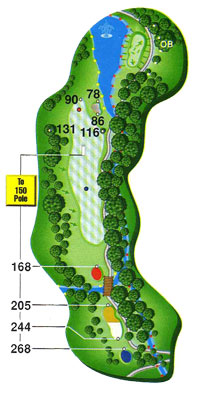 Long par 5 with a creek to the left and Out of Bounds right. This is a 3 shot hole for almost everyone. A deep, front green side bunker makes reaching this in two shots really difficult. 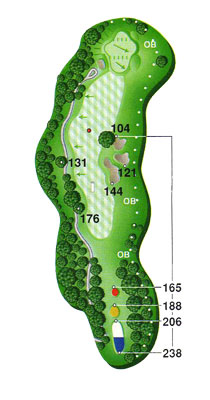 Once again, the green has a lot of undulation, so hitting your approach shot to a specific spot on the green is critical. Dogleg left, as length off the tee is not as important as placement. 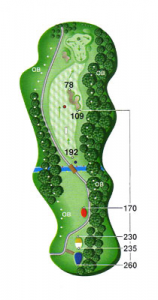 If you avoid the trees on the left and the fairway bunker, you will have a nice approach from an elevated fairway. Trouble around the green is short and left. 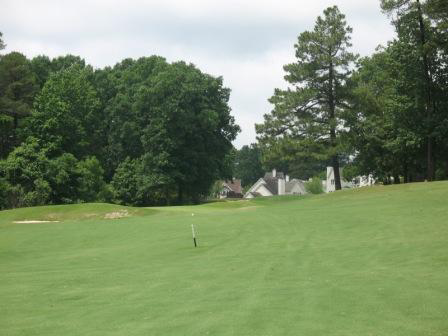 Elevated tee shot to a valley and back up the hill. Avoid the fairawy bunkers on the right. Once again trouble lurks on both the right and left side of the fairway. The green is elevated and it is tough to see exactly were the flag is positioned. Pay attention to the color of the flag and adjust your club selection, accordingly. 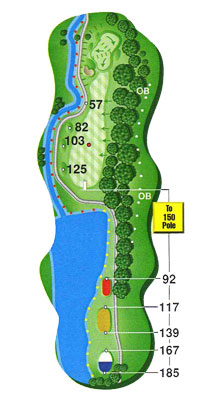 This is a demanding par 4…The tee shot is all downhill, long hitters need to be wary of the pond off the tee. 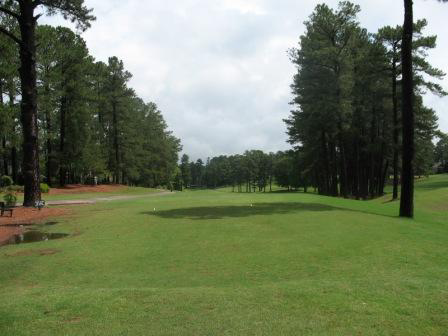 The rightside of the fairway is ideal for a good approach. 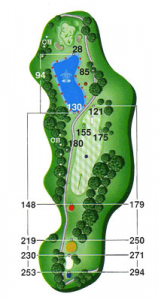 The 2nd shot is all carry over the water and bunkers guard both sides of the green. 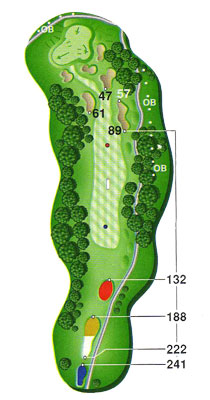 This par 4 is the shortest one on the course, but it can come out and bite you if you are too aggressive off the tee. 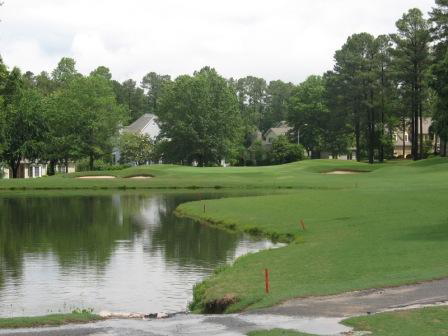 If you carry the water in front of the tee box and avoid the creek on the left, a well placed tee shot will leave you with a wedge approach. Another strong par 3 as water is everywhere. 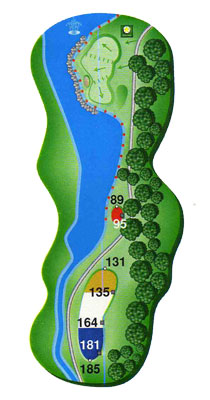 You need to carry your tee shot over water, avoid the water on the left and avoid the water long. A shot just right of the green may catch a favorable bounce. 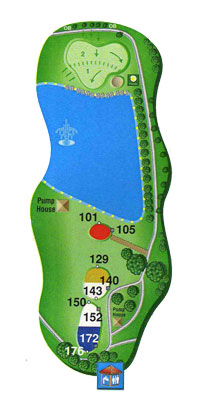 A reachable in two, par 5, if you avoid the tree lined trouble on both sides of the fairway. 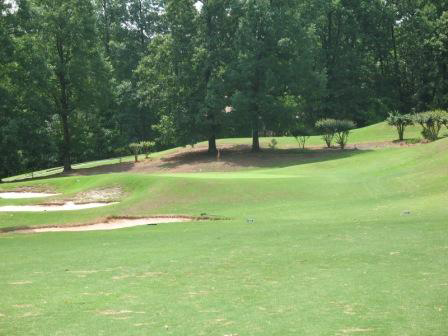 If you need to lay up avoid a grouping of bunkers on the left side of the fairway. 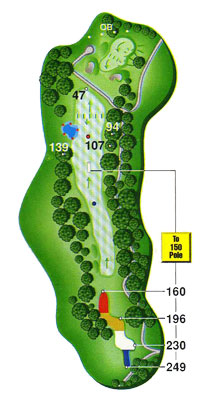 The green is extremely long, a back pin location could be a 2 to 3 club difference. 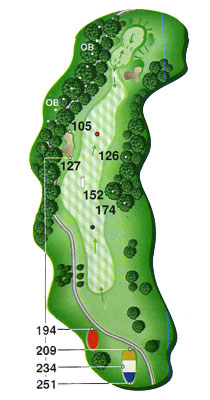 The fairway is all downhill off the tee and avoiding the right side is a must. 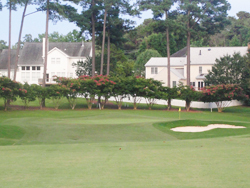 The green is well protected with bunkers and is two-tiered. 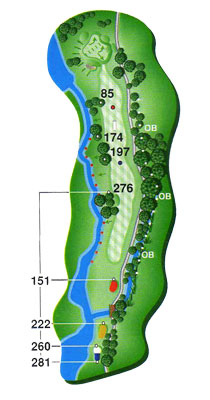 The approach is to an elevated green and the lie is usually a downhill one. 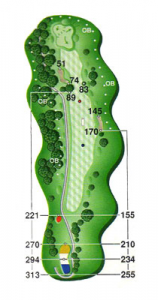 Precision is needed off of the tee as the best approach to the green is from the right side of the fairway. 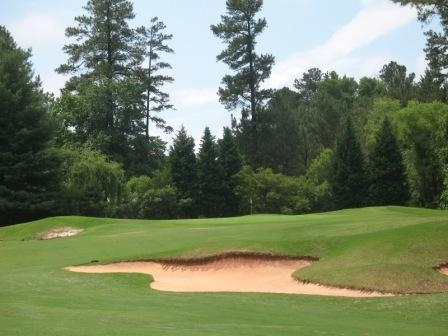 The fairway bunkers can come into play off of the tee and hitting it left could leave your approach blocked by tall trees. 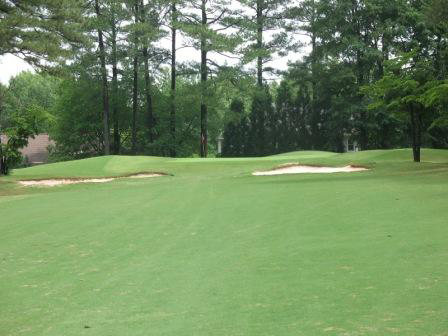 The green is also well protected by bunkers requiring a precise approach. 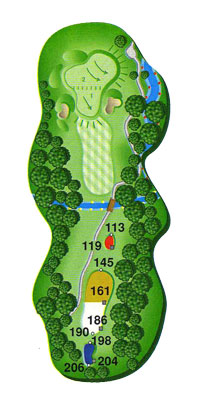 This one is a tough driving hole. 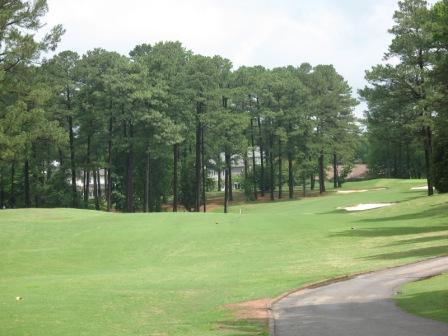 It is a tree lined slight dogleg right and avoiding the fairway bunker is critical. Don’t think about the Out of Bounds right, it comes up on you quick! 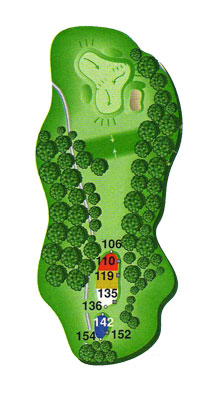 The approach isn’t much easier as you are hitting back into a chute lined by trees. Avoid the bunkers short of the green. 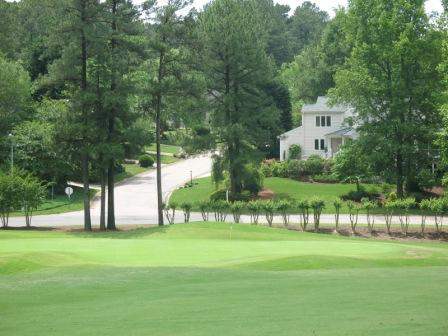 A par 3 with a beautifull background and an elevated tee. The bunker on the right side is very deep, it must be avoided. Text Club – From your phone, text the keyword WILDWOOD to the number 51660. 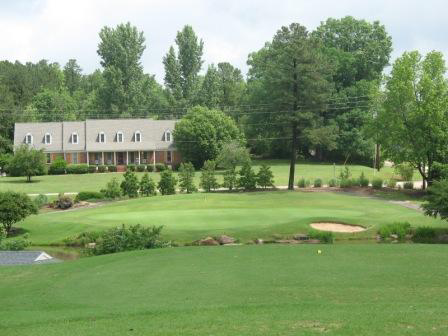 When prompted, reply YES to subscribe.You will receive a text message back that is good for a round of golf including green fee and cart fee for only $25! Present that text when checking in to take advantage of the special. Copyright © 2019 Wildwood Green Golf Club All Rights Reserved.